Mölkky is a very popular outdoor throwing game from Finland. Mölkky is suitable for the whole family and you can play it outside wherever you please. The number of players is two or more and the winner is the player who first reaches exactly 50 points. Mölkky consists of 12 numbered skittles and one Mölkky skittle. The skittles are made of high quality and durable birch. The game is packed in a case made of pine or fir.Rules of the game and a score table are included inside the case. The rules are in English, Finnish, Swedish, Spanish and Germany. 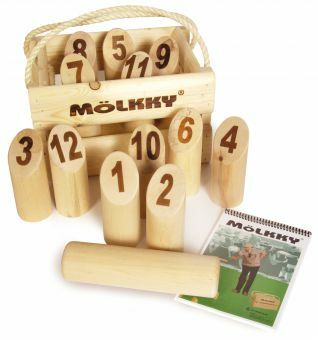 The game is manufactured in Finland.We can offer Mölkky-games also as business gift and print logos or texts on the game.